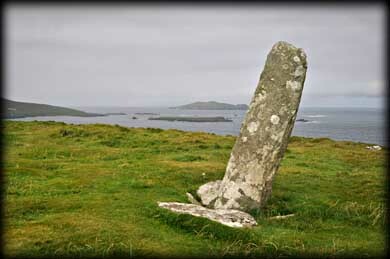 The ogham stone on Dunmore Head was not discovered until 1838. The stone was found lying prostrate by Windele. The two metre stone was re-erected the following year. Standing on the top of Dunmore Head the stone is rather open to the elements but fortunately the ogham inscription is still legible. According to Macalister R.H.A. it reads as "ERC MAQI MAQI-ERCIAS MU DOVINIA" Erc being the name of the person who is commemorated here. This is a stunning location with wonderful views of Coumeenoole Bay and the Blasket Islands. The mist on the mountainside added greatly to the wonderful atmosphere. 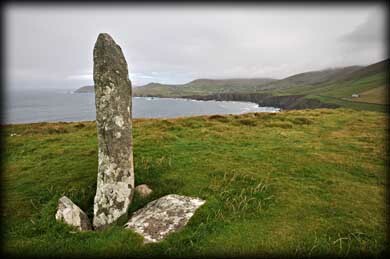 Situated: About 18 kilometres west of Dingle on the Slea Head Drive. Turn left after you see the beach and park up. Walk along the track and climb the wall. Walk straight up the head. Discovery Map 70 :V 3059 9824. Last visit Sept 2012.